Prime Minister Norman Kirk told the 242 crew of the Otago that their Mururoa mission was an ‘honourable’ one − they were to be ‘silent witness[es] with the power to bring alive the conscience of the world’. France had conducted atmospheric nuclear tests at Mururoa (or Moruroa), an atoll 1250 km south-east of Tahiti, since 1966. 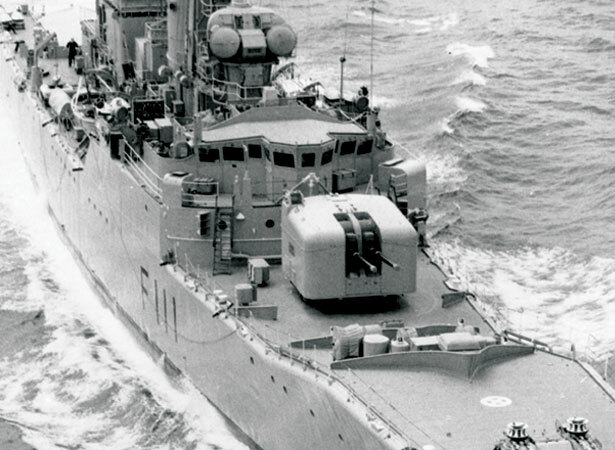 When the French refused to accept an International Court of Justice injunction against atmospheric testing, New Zealand’s Labour government decided to alternately station two frigates, HMNZS Otago and Canterbury, in international waters outside the test area. A Cabinet minister would accompany this daring protest. Kirk put all their names into a hat and drew out that of Fraser Colman, the minister of immigration and mines. The opposition National Party declined an invitation to send a member of its shadow Cabinet on the Otago. The protests had some success. In 1974, by which time 41 atmospheric tests had been conducted at Mururoa, the new French president, Valéry Giscard d’Estaing, decided that future testing would be held underground. Even so, the atoll remained a focus of anti-nuclear protest. The test site at Mururoa was dismantled following France’s last underground explosion in 1996. We have 3 biographies, 3 articles, related to HMNZS Otago sails for Mururoa test zone.